NOWHERE on earth marks Easter with as much wild enthusiasm as Spain. Celebration, ceremony and crowds will descend on cities and pueblos countrywide, with Sevilla’s 50,000 robe-wearers making up the most famous processions on the planet. 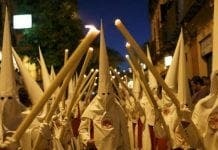 Holy week, or semana santa, will replace city traffic with hooded figures, lifesize religious effigies and wailing trumpets from March 29 – April 5 this year. 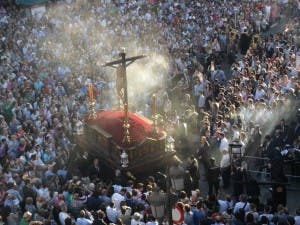 SEVILLA welcomes up to a million visitors for holy week. Crowded but extremely impressive, there are almost 70 cofradias and between six to nine processions each day. The longest lasts a marathon 14 hours. The early hours of Good Friday are the highlight of week. La Macarena – one of Sevilla’s two favourite virgins – emerges from her Basilica at midnight and gran poder can be found in the Basilica del Gran Poder from 1am, with Esperanza de Triana leaving Capilla de los Marineros at 2.10am. MALAGA has been celebrating semana santa since it rejoiced the the Catholic Monarchs’ arrival in 1487, but its contemporary federation of cofradias didn’t take shape until 1921. The cheering and musical accompaniments make Malaga holy week different to the hush of other cities. Also remarkable are the size of its floats, sometimes over five metres long and carried by 260 people. Antonio Banderas makes a special effort to attend Malaga’s celebrations – he often leads the Virgen de las Lagrimas y Favores procession. THE AXARQUIA offers an outdoor reenactment of Christ’s crucifixion with a cast of 600 locals in Riogordo – almost a quarter of the town’s population! This Passion of Christ tradition El Paso, established in 1951 is one of Spain’s most unique events. Attracting 10,000 spectators to the El Calvario outdoor auditorium, it is held in two acts on April 3 and 4 at 4.30pm. 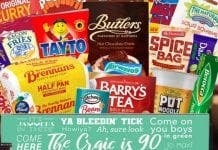 Tickets cost €5-8. MARBELLA and San Pedro come alive in holy week. With nine brotherhoods, the emotive highlight of the week is the silent procession of the Yacente (Reclining Christ) which departs the Santo Sepulcro on Good Friday at 9.30pm. ESTEPONA has daily processions throughout holy week along Calle Real and Calle Terraza with celebrations culminating on Easter Sunday with processions leaving Iglesia del Carmen at 11am. MIJAS combines culture with religious fervour with many activities for children throughout the week and adheres to the most pious of Andalucian traditions, kicking off Holy Thursday with the first procession at 6pm and going into a traditional day of mourning on Good Friday. RONDA has been celebrating Holy Week in style since 1538 and sees 15 processions from 14 magnificent brotherhoods. Many cross the Tajo at Puente Nuevo into Plaza Espana and the night of jueves santo and viernes santo are highlights. With Thursday and Friday of Easter week national holidays, the UK’s Easter Monday is business as usual for Spain. I was in Madrid for Semana Santa in 68. The Gypsy women singing from balconies as the procession passed was very passionate and moving but for the rest – a public display of Sado-Masochism. Masochists flogging themselves – lots of blood. Others crawling on their knees – more blood. Others carrying real wooden crosses being flogged by others dressed as Romans – more blood. Nasty hooded costumes to intimidate and control the masses – a classic example of the Roman ‘bread and circuses’.